World War II is “child's play” by comparison to nuclear war. The atomic bomb’s arrival in August 1945 brought with it a terrible psychosis that has threatened the globe for seven decades. Nuclear weapons have unleashed the worst tendencies in humankind, revealing a suicidal, blind streak that seems to be embedded in our species’ mindset. Over the past few centuries, humans have attacked each other with increasing coldness, reaching a high point during the Second World War with 50 million or more killed. “Both you and I fought in World War II. That war was child’s play as compared to nuclear war”. During the second half of World War II, military plans for aerial or ground assaults calculated death tolls in the thousands, or tens of thousands, which seemed almost apocalyptic at the time. 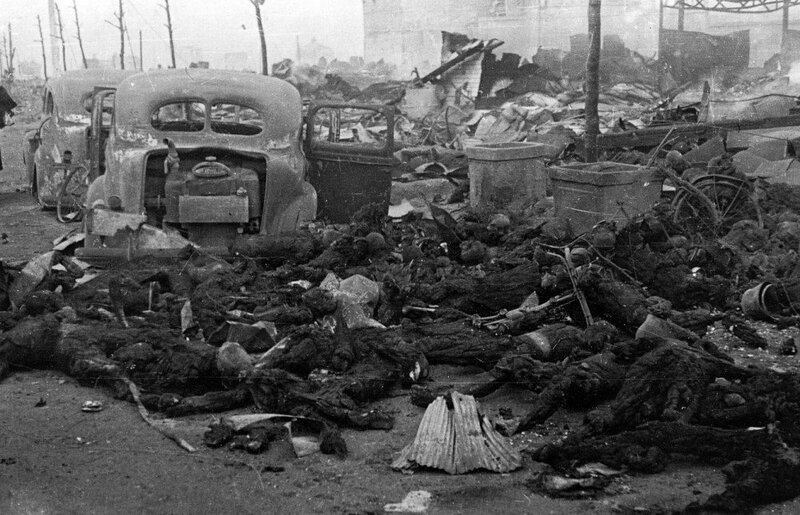 With the atomic bomb’s invention, and from November 1952 the hydrogen bomb, the death estimates suddenly jumped to millions, then tens of millions. The astonishing death toll increases can only have serious psychological consequences for a country’s leaders. Indeed, nuclear weapons “cast a shadow over any crisis or conflict” as a Bill Clinton era study highlighted, while they ensure a “national persona” of irrationality and sinister behavior. Nuclear weapons are consistently used akin to a gunman robbing a bank, the outlaw achieving his goals through intimidation by waving his weapon around but hardly ever firing. Consecutive US presidents have threatened disobedient states with the nuclear gun so as to achieve crucial demands. Evidence of the madness induced by nuclear weapons was witnessed, for example, at a military conference near Omaha, Nebraska in mid-December 1960. At this meeting, in the presence of American commanders from across the world, plans were revealed whereby at least 400 million people would be killed with nuclear attacks. About 300 million would be wiped out in China, along with another 100 million or so from the Soviet Union. Every city in both the USSR and China would be hit. The final death toll would exceed half a billion, as radioactive fallout blown on the wind would destroy the Warsaw Pact states, and also America’s NATO allies in western Europe. US General Thomas Power, commander-in-chief of Strategic Air Command, even expressed disapproval at a suggestion during the conference that only the Soviets be attacked, with communist China let off the hook. As early as mid-September 1945, the US had outlined plans to attack 66 Soviet cities with 204 atomic bombs. Yet, in late 1945, America had possession of only two atomic devices. By the summer of 1950, the stockpile had climbed to almost 300 atomic bombs, so this stratagem was then feasible. By the time General Power was giving his speech at the Offutt Air Force Base in late 1960, the US possessed about 18,000 nuclear bombs – many of which were now of the hydrogen type, up to a thousand times more powerful than the atomic bomb. “I think there are many times when it would be most efficient to use nuclear weapons. However, the public opinion in this country and throughout the world throw up their hands in horror”. Much of the blame for America’s nuclear plans – which continue to the current day – should not, however, be attached to military figures programmed from a young age to serve their leaders, engage in warfare and defeat the enemy. Plans to wipe out the Chinese and Soviets, were formulated during the Dwight D. Eisenhower years of the 1950s. Eisenhower was aghast at a strategy that would kill hundreds of millions, but he accepted the risks and outlined that no other military plan be formulated, mainly for budgetary reasons. The public had been told only the president had authority to initiate nuclear war. However, Eisenhower delegated nuclear authority to his theater commanders, who in turn permitted their own subordinates to initiate an attack, if they felt it was required. This is a policy that surely continues. Part of the thinking behind this is that, should the White House be struck by a Soviet (later Russian) nuclear-armed missile, the president would obviously be eliminated and unable to order a retaliation. Russia would not be harmed. So, to prevent this, many fingers are placed on “nuclear buttons” – and the likelihood is such a scenario is not just the case in the US, but also among the other nuclear powers. The true culprits in planning nuclear Armageddon are the government bosses running the country, who often hail from largely civilian backgrounds, and by definition are supposed to serve the populace. Despite Eisenhower’s successor, John F. Kennedy, also having misgivings about the unprecedented death tolls from nuclear assaults, JFK agreed as well to the “major attack options” in the early 1960s. As likewise did consecutive presidents from Lyndon B. Johnson to Ronald Reagan, and most likely until Donald Trump, who is a strong nuclear advocate himself. As General LeMay pointed out, people are mostly against and fearful of nuclear war – many Americans have long felt it the greatest threat to humanity, ahead of even climate change. Yet government leaders have deliberately imposed the risks of nuclear war on populations, in their bid for global and regional supremacy. The fateful path American leaders chose, in exploring nuclear research through its Manhattan Project, can be traced to decisions made by president Franklin D. Roosevelt from early 1942. Initially, America’s pursuit may somewhat have been driven by beating Hitler in the atomic race. Even during World War II, with the Soviet Union an official ally, American planners were concocting strategies to attack Russia with its developing atomic arsenal. After the Battle of Stalingrad and with Japan in retreat, it was increasingly clear to the Roosevelt administration that Russia would become its only rival at war’s end. Furthermore, the desire to overtake Hitler in attaining the bomb was soon no longer valid. From early 1944, Allied intelligence reports were pouring in that the Nazis’ nuclear program was “idle”. In spring 1945, with the Red Army spilling into Germany from the east, as America and Britain rolled in from the west, it was crystal clear that a besieged Hitler had no atomic weapons. Nor had he seriously desired to, because of a variety of fears and prejudices, as outlined by the influential Nazi war minister Albert Speer in his postwar writings. Yet for America, since 1920 the world’s most powerful country, it seemed a natural progression for her to own the world’s most powerful weapon. 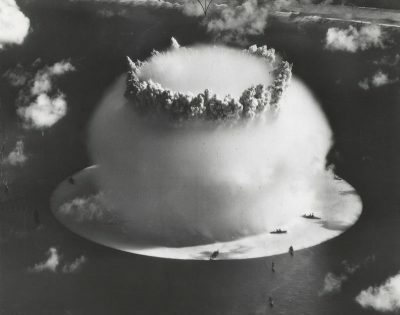 Atomic bomb production came at an initial cost of $2 billion (just under $28 billion today) that continues rising with “upgrades” to current times. The thermonuclear weapons are today over 100 times more powerful than the Hiroshima bomb, with one exchange enough to unleash the extinction phenomenon of nuclear winter, discovered in 1983. When president Roosevelt died on 12 April 1945, Harry Truman carried through the atomic task with zeal, buoyed by enthusiastic support from British counterpart Winston Churchill. In March 1944, US Major General Leslie Groves confided to nuclear physicist Joseph Rotblat that “the real purpose in making the [atomic] bomb was to subdue to Soviets”. The US would utilize its new atomic weapons in demonstrating to Russia precisely who the global power was. The defeat of Japan had long become clear, and the country was already being incinerated by firestorms through conventional American assaults. Continued destruction of each Japanese city through firebombing would surely have compelled Emperor Hirohito to surrender before long, with no A-bombs required. Now as Japan was reeling under subsequent atomic attacks, Stalin, a ruthless dictator at the pinnacle of his power, heeded the message. Indeed, during the Potsdam Conference in eastern Germany, Stalin was informed by Truman in person on 24 July 1945 of the Americans having “a new weapon of unusual destructive force”. All eyes were fixed on Stalin at this moment, such as those of US Secretary of State James Byrnes and British Foreign Secretary Anthony Eden, who noted with dismay the Soviet boss’s calm reaction when told of the “unusual” weapon. “Bourgeois statesmen are very touchy and vindictive. You have to control your emotions; if you are guided by your emotions, you lose”. Meanwhile, hours after the Hiroshima attack, president Truman described the arrival of atomic warfare as, “the greatest achievement of organized science in history”. Truman also assured the American people that “atomic power can become a powerful and forceful influence towards the maintenance of world peace”.